I have to admit that I don’t know all that much about the entire history of Mr. G’s, but there is one thing I AM certain about at present and that is this: No, it wasn’t ultimate “Utopia”, not perfect at all times, or “perfect” in the sense of everybody being content at all times. But for me, it most certainly was the one and only place in my youth where I always felt welcome, always felt safe, always felt love some-how, some-where and from some-one. I’ll be adding more to this “About”, but for now… this statement should be enough to let you know why this blog has begun. How the reminders of passing years continue to haunt those of us still possessing a beating heart and a functioning memory. 43 years ago today, in the dead of a Winter night, what truly was “an era”, a time of joy for a great many, disappeared in a golden-red glow against a deep indigo-grey sky. Today, I don’t suppose there really would have been any “hope” for the old place, considering its age at the time already. And yes, I do suppose that it rather did call out for some repairs and the likes. But one thing that sticks in my own aging mind is the report that, as it burned, back up there on the hill, the “kind” folks of Washingtonville, NY gathered together, in spite of the dark and cold, massed together at the dirt-road entrance to the grounds, and blocked the fire responders from getting there in time to save even a bit of the old place. “Kind”… The people of a quiet, bucolic, gentle little Orange county NY, rural village. To them, it made no difference whether or not anybody was in the building. To them, it wasn’t important that somebody’s financial investment, never mind, emotional investment, was being destroyed. 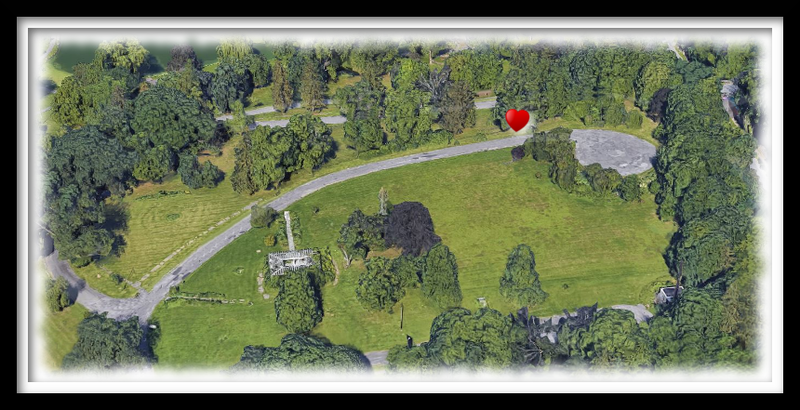 To the kind and gentle, happy little folk of Washingtonville, the moments of happiness the place provided for others was insignificant. Never mind the refuge, sanctuary and safety it, the place, and its owner gave to so very many who truly needed such a place, back then. There was food in the kitchen, drinks at the bar, music on the juke box and acres of “secrets”, of romance, hardships, some drama, and a lot of true, real and honest “love”. The food was turned to ash, the drinks, to empty, broken, charred glass. And as the glowing orange sparks danced into the darkness of the night, the juke box and its music went silent, lights went out, the 45’s melted and cremated. The grand old front porch crumbled and lay in a bed of glowing embers and cinders. And souls of the living, rose into the Heavens, there, and around the Earth. We became “Mr. G’s Roundhill Lodge in exile”… in an eternal diaspora. Out-side the village, off the double-lane paved highway, at the end of an old dirt road that wound its way through the wood-land, over a little brook, away from the world, it stood in rustic, old elegance and glory. Settled on a little hill-top, surrounded by the local old and worn mountains, divinely bucolic by day and vibrant with life and living by night, Mr. G’s welcomed us all, all of us who came to it as pilgrims travel long and far to a remote place on Earth, to purge torn and weary souls, and bask in a divinity of kindred spirits, to commune with one-another and with one’s self. We were “welcome” and “welcomed” there, for who we honestly were and who we dreamed we could or might be. As it lived, and we lived, the main house, the stone house, the bungalows, the ever-cold, spring-fed swimming pool at the end of the wood-land path, the buildings and the very earth it all rested upon pulsed with solid heart-beats, embraced by anticipation, joys and even sorrows of Life itself. When the music from with-in the main house went still, the rhythms, beats, melodies and lyrics continued, in the breezes that blew across the tall grasses and through the old trees. Songs that made the spirit dance and those that comforted the weary souls. Comfort, and even in the heaviest of times, the consolation of others, all together with one simple, basic purpose: a unity that spanned the entire universe, to support one another, when-ever and how-ever was necessary and possible. In sickness, good health, rejoicing and mourning, in times of concurrence and times of disagreement, the commonality of one and all, drinking, dancing, sharing meals and time created more of a “family” amongst familiar faces and strangers than many, if not most, had, even in their own houses and homes. It was a place of shelter, of togetherness. It was a place of protection, from the elements of living, from the elements of existence, from the elements of Life. It was a place of nourishment of body, mind and soul, and it was a place of rejuvenation, often at the end of a week of anxiety, uncertainty, and shrouds of oppression and pretense. There was an un-seen and un-seeable energy in and of the place that penetrated deep into the core of being that lent assurance and the ability, the right, to “be”, to breathe free and freely. If ever a place could be truly called “Home”… this was it. In the buildings and all around the grounds, we, who gathered, were allowed to shed inhibitions, to open hearts and minds. We were as diverse as the global population itself, a microcosm of all of Creation. We were proud and humble, rich and poor, troubled and trouble-free. We were tall, short, Black, White, men, women, local and from a-far. We came from farms, cities large and small, towns, villages and solitary houses out in the most rural of landscapes. We were different, similar and same all at once. We fell into and out of like, lust and LOVE! And together we celebrated the joys and mourned the sorrows as we all healed… one-anther, each-other, together. And.. we danced! And HOW we danced! With steps that had names and others that were more improv expressions of mind, body, soul, spirit! We… DANCED! Some danced in celebration, of something, anything, nothing and everything. Others danced with memories of people, places, events. There were those who danced in joy, and those who danced in sadness. Finger-popping, bangle jangling, singing, whistling, or simply caught up in the rapture of song. “1.2.3.4.5.6.7.8” “You better think… Think bout It” and remember that “Everybody Plays the Fool… sometimes”. So you just “Get On The Good Foot”, because “I’ll Be Around”, “You’re The First, The Last, My Everything”. We’ve all got a “Mighty Love”, a “One Of A Kind Love Affair”. And if you find that “Smiling Faces Sometimes… pretend to be your friend” and the world can have more than a fair share of “Back Stabbers”, and you ask yourself “Where Is The Love?” it’s all really quite clear and simple: It’s “Too Late To Turn Back Now”, because “The First Time Ever I Saw Your Face” I said “If Loving You Is Wrong, I Don’t Wanna Be Right”. So “Let’s Stay Together” because “I Wanna Be Were You Are”, we’ll start a “Love Train” and “Until You Come Back To Me”… “I’m Still In Love With You”. That’s the “Law Of The Land”. Directly or indirectly, consciously and unconsciously, we believed, thought, hoped and probably prayed that G’s would never end, would be there for us through all the years that lay ahead of us. For some, the years were many, and for some the years numbered shorter. But even facing realities, kind and harsh, some little place in our hearts held some crazy little belief that the music might change, the faces and names might change, the buildings and such might change… but they’d change… and always be where they were, on those nights when we arrived, on those mornings when we left and that they’d stay, right there, on Roundhill, waiting for us to return. “No you’re not.” she said, calmly and not at all confrontationally. “And why not?” I asked. In the same state of non-belief that one might experience upon receiving news of the death of a loved one, I turned to page 5A as calmly as I possibly could. 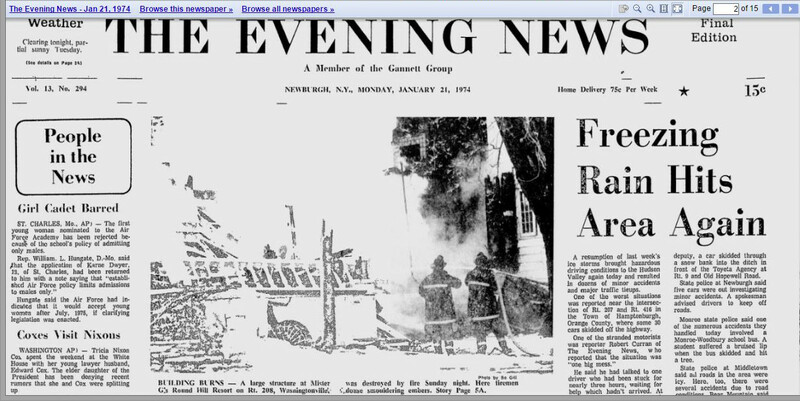 On page 5A was a brief account of some minor injuries of attending fire-men and the passing mention that the fire department in Washingtonville, along with those of several surrounding towns, took 12 hours to extinguish the blaze. All through that week she’d known. But she didn’t have it in her heart to tell me. She said she didn’t know how to tell me. Even as we’d chatted through the day, she’d known, but couldn’t find it in her heart to say. For so long, she’d known what that place had been to me, what it meant to me, and, in many ways, how it saved my life, even to the few weeks before I’d left home and moved so far away. She knew, she understood and she anticipated the crushing devastation that the news would inflict. Even as she placed the paper on the table, words failed. Mothers know. Mine knew me. To be quite honest, I don’t, to this day, remember what the rest of that cold, wet night brought. But in the days that followed, telephone calls confirmed the article. Nobody, it seemed, knew exactly what had caused the fire. There were rumours of arguments between George, the owner, and a guest who set the blaze in retaliation. There were rumours of disgruntled hired staff having set the fire in a fit of maddened revenge. But the one story that never made the news, but had been confirmed by eye witnesses that night was that yes, indeed, as the fire consumed the main house, set back off the main road, away from the nearest village of Washingtonville, the residents, never pleased about the Lodge’s presence, turned-out, on that cold, Winter, January night, at 11:30pm, and with their vehicles and persons, created a barricade across the only entrance to the dirt road that led up to the place, detaining for as long as they possibly could, the responding fire companies, essentially prohibiting them from promptly attending the fire. The years have passed, as years do, all 43 of them. And as I type this tonight, only a day from the 43rd anniversary of the event, as has been all through each and every day, month and year prior, I can still close my eyes, and in the darkness behind shuttered lids, in my mind, my heart and my soul I can travel back to the gravel parking area, in front of the old plantation-like main house. I can hear the juke box singing from inside the main door in the centre of the large front porch that spanned the entire length of the house, and with the same joyful anticipation I had back then, I climb the old wooden stairs, walk into the main foyer, see the people wandering about, talking, laughing, some holding a drink. I can still smell the various colognes and hear, over the music coming from the rear room to the right, conversations and laughter. The room, with it’s black floor, small, round tables round the perimeter, juke box against the wall to the right as I enter, and people, dancing… And HOW they dance! Many of them are now “gone”. I always wonder how many are still around, still alive. I always wonder how many of them still remember. And I do suppose, I always will. I like to think of those who’ve “left” as having gone back to G’s, some-where up in the vast and endless night skies, to where the music still plays, the vignettes of Life continue, and they all still dance… and HOW they dance! 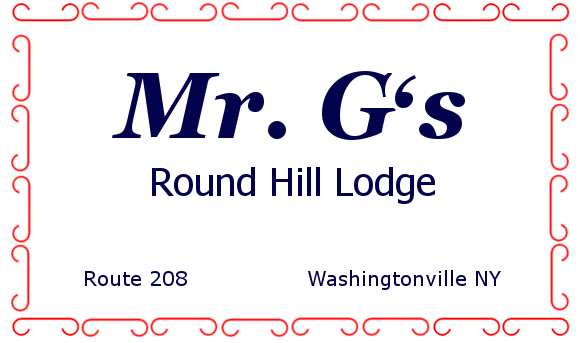 And as for George, the owner of Mr. G’s Round Hill Lodge? Well, I can’t be certain where he is these days, other than one place where I can guarantee he remains and will be, safe, sound, respected and much Loved… and that’s in my heart, where he’ll stay until I too am blessed with the ability to return, to travel up that dark old dirt road, through the woods, over the brook, past the spring-fed chilly pool, to the gravel lot at the foot of the old wooden stairs where again, I’ll climb up to the front door, and with the same joyful anticipation of then, walk through and in to that room in the back… AND HOW I’LL DANCE AGAIN! Good morning heart-ache, here we go again. We don’t have tomorrow… but we had yesterday. and we’d both stay out ’til the morning light.